The oldest known wild Hummingbird on recorded was a Broad-tailed Hummingbird that was over 12 years old. There are over 325 species of Hummingbirds, making them the second largest bird family in the world, second only to flycatchers. Hummingbirds weigh 1/10th of an ounce; about the weight of a penny. Hummingbirds’ brains are about the size of a BB. Hummingbirds have such underdeveloped legs that they are unable to walk. A mother hummingbird weighs only about eight times more than her egg. Hummingbirds lay the world’s smallest bird egg. Hummingbirds generally lay 2 eggs about the size of a blueberry. Ruby-throated Hummingbirds have one of the highest nesting success rates of any Neotropical migrant. Ruby-throated Hummingbirds will have two broods, each taking 45 days from nest construction to fledging. Hummingbirds use spider webs as glue to attach the nest to a tree branch as well as a binding agent for the building materials. The nest is about the size of a golf ball; around 1 ½ inches in diameter. Only about 20% of Ruby-throated Hummingbird fledglings survive their first year. Hummingbirds eat about every 10 minutes. They do not have an innate preference for red. Each hummingbird must learn the association between red flowers and food. During one freeze, killing food sources, a male Anna’s was seen to kill another, using its bill as a spear. You can help birds through such emergencies by providing extra feeders; even simply serving sugar water in any small dish for a few days. 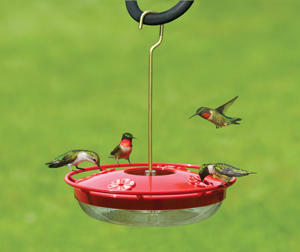 Hummingbirds can drink up to twice their body weight in nectar every day (most birds only eat ¼ - ½ their body weight). They drink nectar from plants and sugar water from feeders. Hummingbirds lap up nectar with their long tongues. There is a groove on either side of the tongue that creates a capillary action to help draw the nectar up the tongue and into the mouth during the lapping action. Hummingbirds can extend their tongue approximately a distance equal to the length of their bill. While lapping up nectar, Hummingbirds can move their tongues in and out of their bill at a rate of up to 12 times a second. Female Hummingbirds’ tongues are longer than the males. They eat insects and insect eggs on the ground and in trees. They love spiders and spider eggs. They use their bill and not their tongue to catch insects. One research study recorded an Anna’s Hummingbird visiting over a 1,000 flower blossoms a day. Hummingbirds can fly up to 60 miles per hour, but typically fly at 30-45 miles per hour. They can hover and are the only birds able to fly backwards and upside down. They can do this because of an extremely mobile shoulder joint. Their wings beat 20-80 times per second. Hummers avoid deep water, but will bathe in shallow pools or dishes, and love to take showers in sprinklers and misters. To keep their feathers in top shape, hummingbirds will leaf-bathe by fluttering against wet leaves. During the night, Ruby-throated Hummingbirds can enter into a state of torpor to save energy. Similar to a type of short-term hibernation, torpor reduces their metabolic activity and drops their heart rate from 1,200 beats per minute to 50 beats per minute. Hummingbirds can be very feisty and aggressive when defending their territories and will even chase away much larger birds. The male hummingbird’s gorget (throat patch) is iridescent and reflects certain color wavelengths. Some of these unique throat colors can be used to identify specific male species. Anna’s Hummingbird flashes neon pink; Costa’s is violet; Magnificent is green; Ruby-throated is ruby-red; and the Blue-throated is vivid blue. Hummingbirds have been known to fall prey to Bull Frogs, Praying Mantis and large spiders.